Cliff Bungalow is located south of 17 Avenue South and west of 4 Street West. 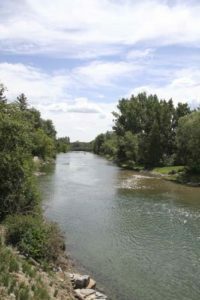 Its western edge is a forested bluff and the southern edge borders along the Elbow River. Nearby communities include the Beltline to the north, Mission to the east, Rideau Park to the south across the Elbow River, and Upper Mount Royal and Lower Mount Royal to the west. Cliff Bungalow real estate features mostly condos and townhomes. There are a variety of newer and older properties, many with outstanding views of downtown, the mountains and the Elbow River valley. With both 17 Avenue South and 4 Street West steps away, there are endless choices for shopping, dining and entertainment. There are a few major retailers on the stretches, including a grocery store and a Best Buy. Many of Calgary’s hottest restaurants call 17 Avenue their home, attracting Calgarians all days of the week. Getting to and from the community is simple. There is lots of access off 17 Avenue and 4 Street, and a variety of Calgary Transit buses travel along those two roads. Walking to downtown is quick, and cycling is even quicker with Calgary’s cycle track network nearby. There are pathways for pedestrians and cyclists along the Elbow River that go from the Glenmore Reservoir to downtown. Cliff Bungalow is home to Western Canada High School. There is also an active community association that partners with Mission. For more information about this SW Calgary neighbourhood, contact us today!